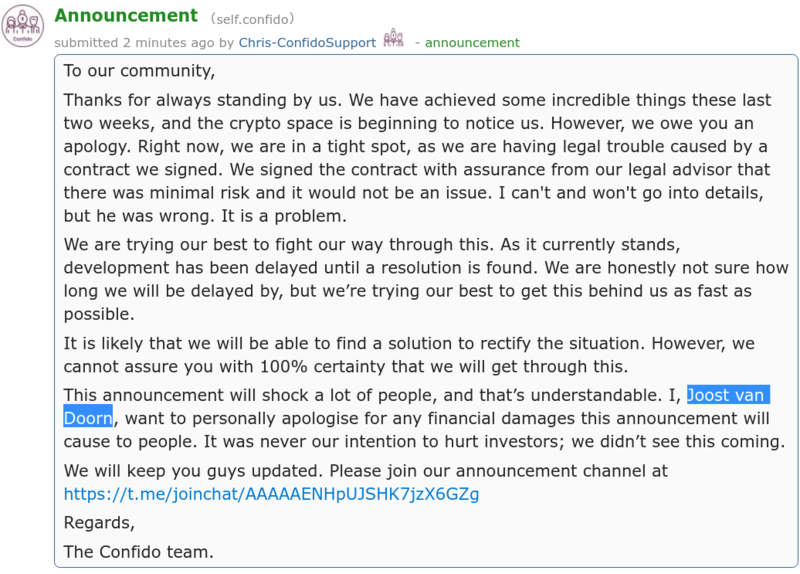 A company called Confido raised a small ICO by selling special CFD designed to allow “safe and trustless cryptocurrency payments. According to ICODrops they raised their goal of about $400,000 and quickly disappeared, taking the cash with it. The site is currently a parked web server that points to nothing. According to the Reddit coordinator for the ICO, the move “is completely out of character” for Joost. “There is potential that the removal of everything was due to the legal situation that they are facing, which is possible as I got the feeling that the situation was dire. I don’t agree with this course of action however, as it has left the entire community, and myself, in the dark,” he wrote. The ICOs or token sales are red hot right now but I’ve spoken to a number of founders who are dealing with the same legal troubles – albeit in far less drastic ways – and who are eschewing the process entirely due to legal, logistical, and security issues. Given the amounts of cryptocurrency involved and the multiple moving parts including legal cover, white paper production, and monetary management, it’s a wonder more token sales don’t flame out like this one. As of today there is no way to contact the founding team. The tokens rose to a price of about $1 before crashing back to a penny. “These were very good scammers,” Eli Lewitt, co-founder of TokenLot, told Motherboard.